Could these €30,000 family log cabins help solve Ireland's housing crisis? These affordable log cabins could be the answer to Ireland's housing crisis, providing family homes from as low as €30,000. An innovative businessman believes he can help minimise the housing issue - and maintains he can build the fully functioning homes in just ten weeks. While a €30,000 log cabin (measuring 5x7 metres) could provide two bedrooms, a living room and a bathroom, a €70,000 abode (measuring 7x10 metres) could offer three bedrooms, a kitchen, a living room, a dining room and a bathroom. The cabins come in all sizes up to a maximum of €100,000 - substantially less than modular homes built in north Dublin for €243,000 each. The price includes the cabin and electrical wiring but water and furnishing is up to the owner, according to the Estonian entrepreneur. “Our smaller cabins are popular for offices, playrooms and home bars. Today I had five couples already looking at the cabins and on Saturdays we have queues,” he said. The company has seen some growth over the past year as people have more disposable income after the recession. 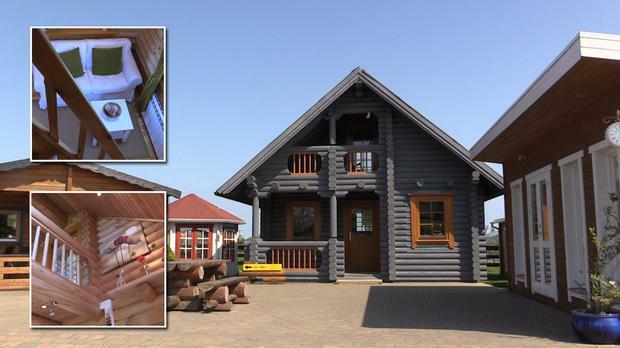 The cabins are made from Strauss wood which is imported from Estonia. Dublin County Council has yet to grant planning permission for the wood cabins in the city, but permission has been granted in the countryside. “I don’t understand the planning permission because I think it could quite easily solve the problem of housing because cabins are affordable,” said Laanisto. “People want to use these cabins for living but planning permission is the issue.